What do you do when it's a holiday weekend and you just don't feel like studying? Well, first you do some cleaning and then you move on to baking. My mom first shared this recipe and then Austin's boss and we decided it was time to jump on the bandwagon and make the super-easy NY Times No Knead Bread. 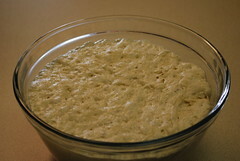 You mix up the four ingredients (flour, water, yeast, salt) the night before and let your bread sleep. It turns into a bubbly, mad scientist blog. The next day, you give it a few turns with a spatula or your hands and it turns into a less-gooey ball.The bread naps for a few hours. 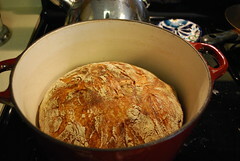 Then preheat the oven with your big cast iron pot inside, throw the dough into the pot when preheated, and voila, bread! 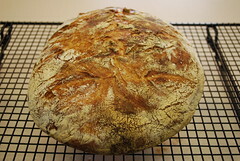 Beautiful, crusty, chewy, delicious bread. Rip it up while hot, smear on some butter, and enjoy the simple pleasures of life. I looks amazing! Nice job!